I'm having a little trouble coming up with 5 things, must've been a slow week...but I'll do my best! 1. 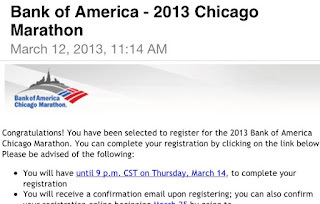 As you know, I'm running the Chicago Marathon. I'm so ridiculously excited, I just felt like I needed to mention it again. Sorry! I promise I won't talk about it all the time! 2. I don't know why I just discovered Edamame. I made it with soy sauce. It is amazing. I could pretty much eat it every day! 4. Remember my 30 Day Vegan Challenge? Well, it lasted 10 days. It was HARD! My 3 week juice fast was easier than that! I think the hardest part was trying to find food that didn't have eggs and dairy in them. I do plan on staying vegetarian though. Ever since giving up meat a couple years ago, even though I had started eating it again, I still couldn't eat it without thinking "this animal used to be alive", and other things!! 5. The Bahamas! I am dying to go back here, and on another cruise again! I don't think we'll go on the Carnival again though. I want warm weather SO bad! That's all, folks! My plans for the weekend are an 18 mile run tomorrow, my sister's baby shower, dinner with my family, then celebrating St. Patty's day with a girlfriend at an awesome little blues/jazz bar on Sunday! What are your 5 things? Or 1 or 2? I love edamame! They make microwavable packs perfect for taking to work and heating up. I didn't know they make microwavable packs! I must find them! Good luck with your upcoming marathon! I don't know personally how hard it is to run a marathon or even a 5K, but my husband tells me all about it and he loves doing them especially through Team-In-Training! He just finished the San Diego Half Marathon and is planning on doing sprints for several triathlons this summer. My plans this weekend: painting some walls that need touch up in the house and deciding what washing machine to buy to replace our old one that just broke last night! Stopping by from Aloha Hop and a new follower of yours! http://thedoilyduck.blogspot.com... Come stop by sometime! Hey Jessica! That's awesome that your hubby does his runs through Team in Training. I'm considering doing a Tri someday...but I don't know for sure! Love the Bahamas, too! My hubby and I don't care for cruising but we are going to fly directly to the Bahamas for 5 days for my bday. Can't wait! I just returned from warm and sunny Arizona. I loved running every morning and watching the sunrise and then going out again to watch the desert sunsets. They are priceless! I'm back in cold and gloomy DC, but Spring is around the corner. Yay! 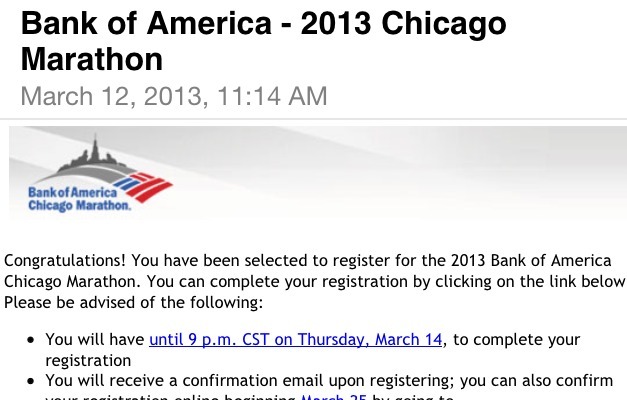 So excited for you and the Chicago Marathon! Will it be your first full? Have fun with your long run today. Doing ours tomorrow because of red-eye jet lag. Wow, what a wonderful birthday present! It's cold and gloomy here today too. I'm SO ready for Spring! My first full is in 5 weeks! I'm running the Carmel Marathon, in Indiana. Hope your long run goes well! Great pic of you on the cruise! I love hearing those kind of stories too. Being a vegetarian is pretty easy, but you're right, almost everything we eat has some kind of animal by product in it! That is so neat! I've never had a brush with a famous person =) I'll have to read his story. My only plan was a 17 mile run and I knocked that out yesterday! I'd love to hear more about running as a vegetarian! Wow, great job on your 17!! That's awesome! Honestly, I don't feel any different running as a vegetarian, than I did when I was eating meat. It's like my body didn't even notice it! It is tricky to find processed food sans milk and eggs. Especially since there are about a zillion forms of milk products in foods, too! Exactly! I had no idea there were so many different forms of milk products!